NY Spender: book review and giveaway: shoo, jimmy choo! book review and giveaway: shoo, jimmy choo! 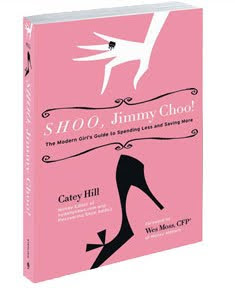 While at first it might look like a book focusing on fashion advice, SHOO, Jimmy Choo! is actually a very "fun to read" personal finance book, that focuses on young female readers (about 25 years old) with a passion (problem) for spending. I have read many personal finance books from big financial gurus like Suze Orman and Peter Lynch, and at first I was worried that I was going to get bored reading yet another personal finance 101 book. Fortunately, Catey Hill approached the sometimes dry subject with a fun attitude and while I was familiar with most of the content, it was still interesting to read and at times it even made me chuckle (financial books are not usually a laughing matter). Chapter by chapter, SHOO, Jimmy Choo! delves deeper and deeper into each of life's sectors, by first analyzing it and then providing the necessary suggestions that will help a person achieve financial freedom. The first chapters guide you in understanding what is your spending style (shopping personality). You can take your pick between Impulsive Spender, Compulsive Spender, Social Spender... I am an Emotional Spender, meaning I am more likely to spend if I am happy or sad. 1) If you are feeling down/happy/whatever your trigger emotion is, don't take your credit card with you, just bring limited cash. 2) Try an activity that will make you feel better (or that you'll enjoy), but that won't put a dent in your finances. Go for a run, take a walk with your girlfriends, lay out in the park, or rent a movie. And then the book turns into a full-fledged personal finance introduction book, with advice on how to set up a budget, how to tackle your debt and how to use your credit card wisely. It also touches subjects like how to save and invest your money, how to manage student loans, what kind of insurance you need, how to advance in your career, interesting facts about taxes and tips for financially sound relationships. The only fault I've found in SHOO, Jimmy Choo! is that at times it can be repetitive, but considering that it is geared towards readers new to the subject, it makes sense that the author wants to make sure that each new lesson sticks before moving on to the next one. If you still are in your 20s and you don't know much about personal finance and want to learn, yes! If you are in your 30s or older, some of the book's advice won't apply to you, but you could still benefit from most of it. For a chance to win a copy of SHOO, Jimmy Choo! leave a comment on this post with your financial reason for needing/wanting this book, by Monday, February 1st, 2010. I will pick a random winner on Tuesday, February 2nd, 2010. US addresses only. Good Luck! My financial reason for wanting this book.. well, I tend to become fixated on the purchase of frivolities. This sounds like a book that offers some ground. Also I am in my 20s and could stand to learn more about finance. I would love to not be so attached to material expensive things, and do better things with the money I spend. This would be a great read for me. I would love to read this book... I am nannying now and money is not an issue because I have very few bills but should be planning better for when I have bills again and I am also thinking of spending 3 to 6 months working in an orphanage or homeless shelter for teens so need to plan for that as well. I'd love to read this book. I am barely 30, but definitely need a fresher approach to spending and budgeting. I can't get through most financial advice enough to use it! I do what I can, but I still live paycheck to paycheck and need some good tips on how to save.